Fun in the sun may be San Diego's calling card, but there's far more to the county than its 70-mile-long (113 km) coastline. San Diego County sprawls over more than 4,000 square miles (10,360 sq km) of canyons, mountains and desert. The City of San Diego (one of 18 incorporated cities in the county) is the nation's eighth largest, and the county is California's third most populous. Fortunately, there's lots of room for San Diegans to live and play. Once nearly deserted at night, downtown San Diego has evolved into an exciting center city with several neighborhoods and endless attractions. Its Gaslamp Quarter, Little Italy and East Village are packed with restaurants, clubs and shops. The Embarcadero along San Diego Bay passes by the Maritime Museum with its iconic Star of India's tall sails to the sweeping rooftop of the San Diego Convention Center (which is about to undergo a major expansion). Cruise ships berth at the foot of Broadway, the main artery into downtown, and passengers flying to the San Diego International Airport pass over high-rise business towers as they land at the northern edge of downtown. Hotels of every description and hip-quotient are scattered throughout the city's center, making it one of the most desirable places to stay while exploring the county. The arcing San Diego-Coronado Bridge connects downtown to Coronado. Often referred to as an island, the genteel city actually sits on a peninsula attached to the mainland by the Silver Strand, a narrow strip of road and sand running past quiet lagoons and pristine beaches to the southern part of the county. Ferries cross the bay between downtown and Coronado as well, giving travelers a chance to enjoy downtown's urban delights, but sleep by one of the world's loveliest beaches. Balboa Park, the city's cultural heart, covers 1,200 acres on hills and canyons just east of downtown and is home to the justifiably renowned San Diego Zoo, more than a dozen museums and The Old Globe, winner of multiple Tony awards. Gourmet restaurants and gorgeous Victorian mansions line quiet streets in nearby neighborhoods including Bankers Hill, Hillcrest and Mission Hills. Beach towns line the coastline from the border with Mexico (18 miles (29 km) south of downtown) to Oceanside. Each town has it unique character, from Ocean Beach's hippie holdover vibe to classy La Jolla's Mediterranean village sensibility. Beloved by surfers and escapists (who can afford staggering housing prices), a series of small communities line the coast north of La Jolla's Torrey Pines State Park. Dozens of cities and communities dot the canyons and mesas between the coast and a series of mountain ridges to the east. Amid the residential neighborhoods, including some of the nation's wealthiest enclaves, are championship golf courses, polo fields, wineries, breweries, casinos and the San Diego Zoo's Safari Park. The Laguna and Cuyamaca mountains and Cleveland National Forest rise above these inland attractions, and beyond the peaks, highways descend to the Anza-Borrego Desert State Park, still within San Diego County's boundaries. Beyond all its outdoor attractions, San Diego also has a rich cultural and intellectual soul. Writers, artists, musicians and scientists conjure ideas while surfing the La Jolla Shores or jogging in Mission Bay Park. The Old Globe and La Jolla Playhouse, both Tony winners, frequently send plays to Broadway. Multiple scientific landmarks including the Salk Institute and Scripps Institute of Oceanography are magnets for some of the world's brightest minds. Thanks to prescient developers and determined preservationists, downtown San Diego evolved into an exciting, cosmopolitan city with several hip neighborhoods over the past few decades. The heart of the action is the historic Gaslamp Quarter packed with classy nightclubs and restaurants of every description housed in restored 19th-century Victorian, Baroque and Frontier buildings. Petco Park, downtown's exceptional baseball park (and occasional concert venue), has been the impetus for the burgeoning East Village neighborhood filled with trendy condo complexes, boutiques and cafes. The Embarcadero sidewalk beside San Diego Bay runs past a fleet of vessels including cruise ships, aircraft carriers, ferries, historic paddleboats and handsome yachts. Little Italy, a few blocks north of downtown's core, has undergone a nearly complete transformation from a simple Italian community to a desirable urban neighborhood. Fortunately, several venerable pizza parlors, bakeries and bars remain amid modernist condo complexes, gourmet restaurants and trendy shops. The whole downtown region throbs with excitement day and night, and is now the center of San Diego's nightlife scene. Development continues on the edges of downtown as construction has finally begun on a new central library. There's talk of a football stadium downtown as well. The urban core continues through established neighborhoods including Bankers Hill and Hillcrest, the always-hopping heart of the gay, lesbian and transgender community. The Pacific Ocean casts its spell over San Diego. Surfers, swimmers, boaters and anglers all find room to play in and on the water. Mission Beach has a boardwalk and Belmont Park's rollercoaster. 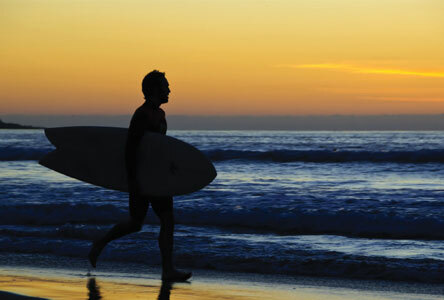 La Jolla Shores offers a mile-long beach with areas for kayakers, divers, surfers and swimmers. Bright orange Garibaldi and other exotic fish draw snorkelers to La Jolla Cove, while harbor seals have taken charge of the nearby Children's Pool. Mission Bay Park is a 4,236-acre panorama of blue water and green lawns with manmade channels lined with hotels, marinas, several playgrounds and miles of bike paths. East and north of the center city, the landscape changes dramatically. Lakes and reservoirs offer freshwater fishing and serene areas for putting about in motorboats. Pine trees shelter campgrounds in the Cuyamaca Mountains and Cleveland National Forest. Julian, a classic mountain town, is a popular spot for lilacs in spring and apple pie in autumn. Beyond the mountains, the Anza-Borrego Desert State Park provides hiking trails through palm canyons and fields of cacti. It's possible to see all these wonders during a long day's drive, but golf resorts and B&Bs throughout the region offer shelter if you care to commune with nature. Portuguese explorer Juan Rodríguez Cabrillo discovered San Diego Bay in 1542 but sailed on north, leaving the Kumeyaay Indians alone in their warm, food-rich home. Today, members of the region's several tribes are reaping the riches of their heritage at casinos in San Diego's East County. Cabrillo's arrival is now commemorated at Cabrillo National Monument atop the tip of Point Loma overlooking the bay. European settlers returned in 1769, building a fort and mission church at Presidio Hill, a gorgeous swath of lawns above Old Town State Historic Park, which contains many of San Diego's oldest buildings. Today's downtown evolved in a burst of development in 1867, leaving behind the collection of historic homes in the vibrant Gaslamp Quarter. San Diego's most impressive Spanish-Colonial buildings were constructed in Balboa Park for the 1915–1916 Panama-California Exposition; its tiled California Tower has become a treasured landmark and several of the exposition's ornate buildings house the park's museums. With the San Diego Zoo, Safari Park, LegoLand and SeaWorld at hand, families find plenty of excitement and memories. Downtown's New Children's Museum is an eco-friendly playground for all family members. Its multi-cultural, bilingual exhibits make learning fun, and the adjacent one-acre park gives kids a place to burn energy. Teens enjoy exploring fighter planes and flight simulators at the USS Midway Museum, a 1,001-foot-long (305 m) aircraft carrier berthed at downtown's Embarcadero. For inexpensive entertainment, try bicycling at Mission Bay and Coronado, fishing off piers in Imperial Beach and Ocean Beach, stargazing from Mount Palomar and spotting cactus flowers in the Anza-Borrego Desert.